Thanks to Catherine of Thoughts All Sorts for this recommendation. Brief Synopsis – A Nobel Prize winner is invited to the annual ceremony to collect his award and gets involved in international intrigue and espionage. My Take on it – This is another film that I had never heard of before it was recommended to me and I liked the Hitchcokian feel of this storyline. The idea to mix Cold War political intrigue with the Nobel Prize Ceremony is a great one and the story makes so much sense for the time it was made for. Unfortunately, the heavy Cold War theme feels a bit dated 55 years on, yet still works within the constraints of the knowledge of that day. The story moves along at a great pace and remains interesting the whole time due to the various twists and turns along the way. 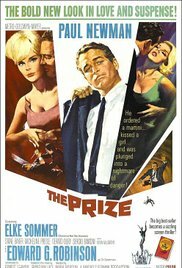 This isn’t one of Paul Newman’s best roles, but it still is a memorable one for him because he plays the role of a drunk author quite well. Edward G. Robinson is great in his role because he is so convincing at everything that he does here. Bottom Line – Newman is great here as the savvy author who gets caught up in more than he imagined. The idea to meld together the idea of the Nobel Prize ceremony with an espionage plot that could ignite the Cold war is ingenious and it would seem like a great idea for a Hitchcock thriller. The story moves along at a nice pace and things remain quite interesting the whole way through. Feels a bit dated due to it’s heavy Cold War ideas, but still works 55 years later. Robinson and Newman are both great here despite this not being the best role of either of their careers. Recommended! Whew…I’m glad I recommended a movie that your enjoyed.